If you are wondering what’s behind that giant black screen at 6350 Germantown Avenue, I can tell you it’s not a junkyard. Although that might be up for interpretation. The property is the studio of visual artists Kate Kaman and Joel Erland. I stopped by for a somewhat bizarre little visit after the Germantown Town Hall workshop today. 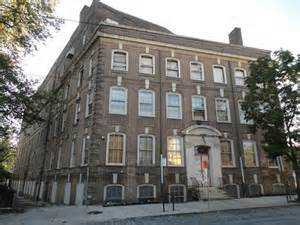 The space is open to the public this weekend for Philadelphia Open Studio Tours from October 10-11, noon to 6pm. As I rambled around the studio, I was excited to see a small mockup of the large scale work The Unseen World, which may have caught your eye if you travel along North Broad Street between Germantown and Center City. The suspended illuminated sculptures are on display inside the atrium of Temple University’s newish School of Medicine building and visible from the street. Turns out they’re bacteria! And this is a Kaman + Erland work! The artists worked closely with the architecture and engineering firm Ballinger while creating the piece, which is a signature feature of the building’s public spaces. Now you know what’s behind the screen. Visit http://ekeart.com for more on their work. And thanks to Germantown Artist Round Table‘s Paula Paul for the POST reminder, and for handing me a photo copy of the guide page listing all of the studios in Germantown participating! Get to know your neighborhood artists. On Saturday, June 21 over two dozen planters and tree pits will be planted with vibrant annuals and perennials on a two-block stretch of Germantown Avenue between Penn Street and Bringhurst Street. The zone was selected by Tree Germantown and the W Rockland Street Project as a corridor greening pilot experiment. Despite lacking a formal business association, this lesser-known Germantown business district is full of life with the addition of two new businesses, Sandalwood Yoga Studio and the soul food restaurant Tasties. 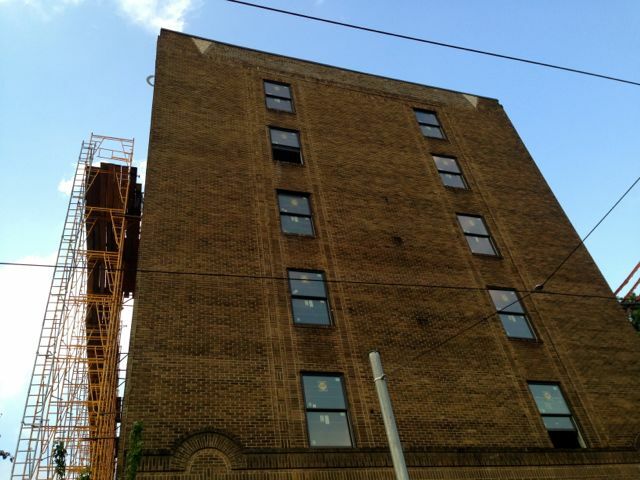 There are also three building renovations underway including new construction for Around The Clock Home Health Care just before Penn Street, developer Ken Weinstein’s renovation of the 6-story building at 5301 Germantown Avenue, and Stan Smith’s renovation of 5320 Germantown Avenue. Tracy McNeil, owner of the yoga studio at 5310 Germantown Avenue, recently completed a historic renovation of the property which includes the storefront studio on the street-level and apartments on the upper floors (read about the renovation at NewsWorks.org). 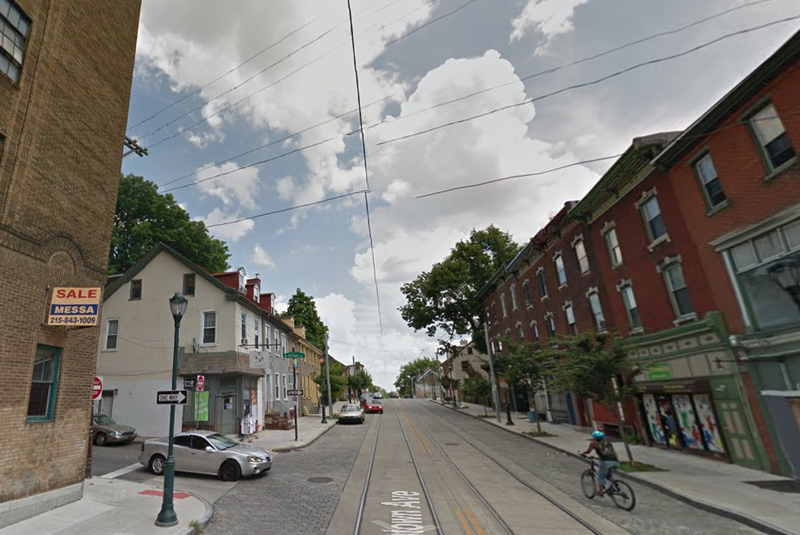 Google Maps capture of Germantown Avenue from Penn Street looking towards Bringhurst Street. Aine Doley (that’s me!) and Penn Knox resident Amy Steinbugler went door-to-door to pitch the planting project and discuss the benefits of bringing greenery to Germantown Avenue. Many businesses were eager to join the effort, but some took convincing. Those who declined to participate raised concerns about the plantings being able to survive the urban environment and the shoppers who frequent businesses along the corridor. Will the planters be stolen? Will passersby put trash in the planters? One business owner believed that people would urinate in the planters and sit on them while waiting for the 23 bus. Each participating business is contributing $25 per planter and has agreed to care for and water the new plants in front of their business. This project was made possible through generous donations from our community partners, who have helped to subsidize the costs of materials: Historic Germantown, Germantown United CDC, G’Town Restoration CDC, and the City of Philadelphia’s PhillyRising initiative, which selected Germantown as a Philly Rising 2.0 neighborhood in early February. As Germantown continues to grow, Tree Germantown and the W Rockland Street Project will continue to push for greening and tree planting in our neighborhood. Volunteering during the planting day is a great way to meet neighbors and get to know local business owners. Join us on Saturday, June 21 from 9 a.m. to 2 p.m. Email treegermantown@gmail.com to sign-up and visit facebook.com/treegermantown for additional volunteer information. There’s a buzz. There’s a hum. There’s that hammering and drilling again. The noticeable uptick in development projects in Germantown has pushed us to expand the W Rockland St Project’s focus and create a development news section on our blog that we’re calling Changing Germantown. Lately Germantown has been in the news for an array of neighborhood revitalization and community development activity. 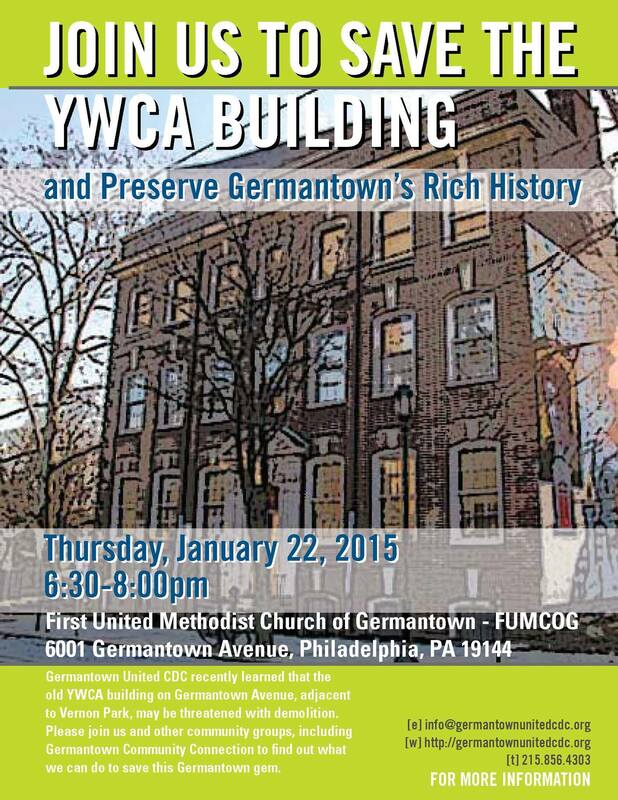 In February it was announced that Germantown was selected as a PhillyRising 2.0 zone. We’ve got the Germantown Special Services District (GSSD) cleaning the main business corridor again. Soon the Queen Lane apartment tower will be demolished and new housing will emerge. 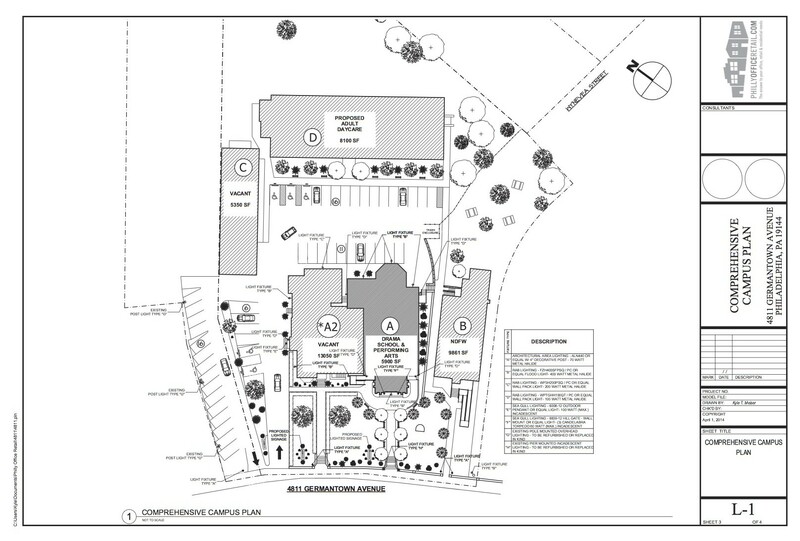 After watching the foundation of a new building go in on the 4300 block of Germantown Avenue between the Germantown Friends School parking lot and the Holsey Temple Christian Methodist church, we decided to find out what it would be. 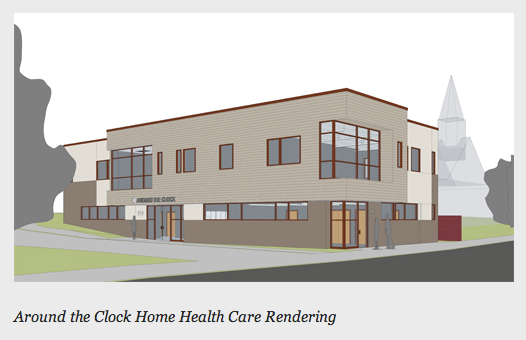 The building will house Around The Clock Home Health Care, a privately owned and operated agency that provides daily home health care services including personal care, meal preparation, light housekeeping, respite care, companionship, escorts and more. 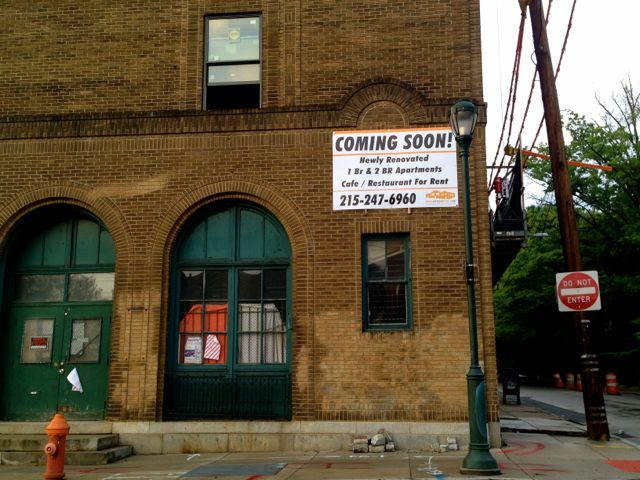 The business is moving from its headquarters at 5245 Germantown Avenue, an office building just a few blocks away owned by developer Stan Smith of Philly Office Retail. 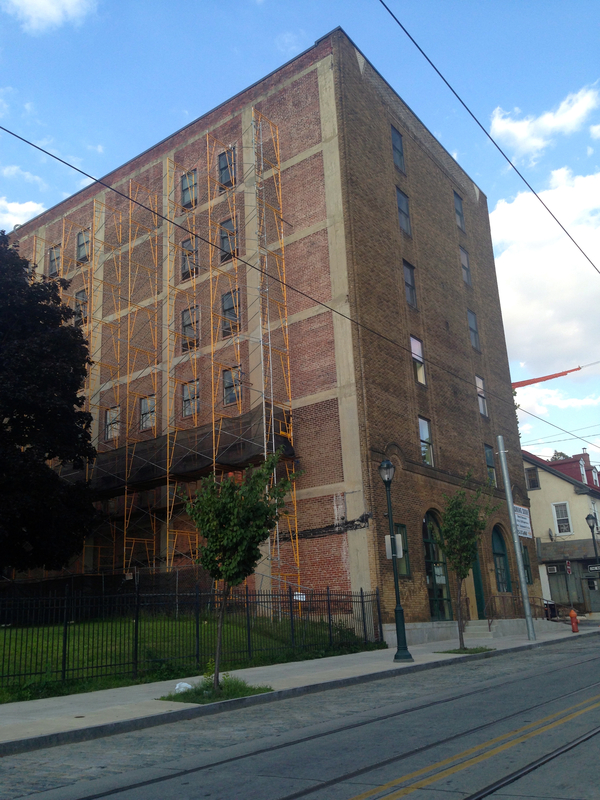 New construction on the 4300 block of Germantown Avenue. Photo by Aine Doley. A Google maps satellite image of the site in 2012. The 4300 block of Germantown Avenue falls between Coulter Street and Penn Street. The new facility will primarily be used as office space for Around The Clock employees, according to a recent NewsWorks article. “It will also provide additional room to expand training programs for its employees so the company can ultimately provide more diverse services to seniors,” wrote Queen Muse. This business district is full of life with two new businesses as near neighbors, Sandalwood Yoga Studio and the soul food restaurant Tasties. 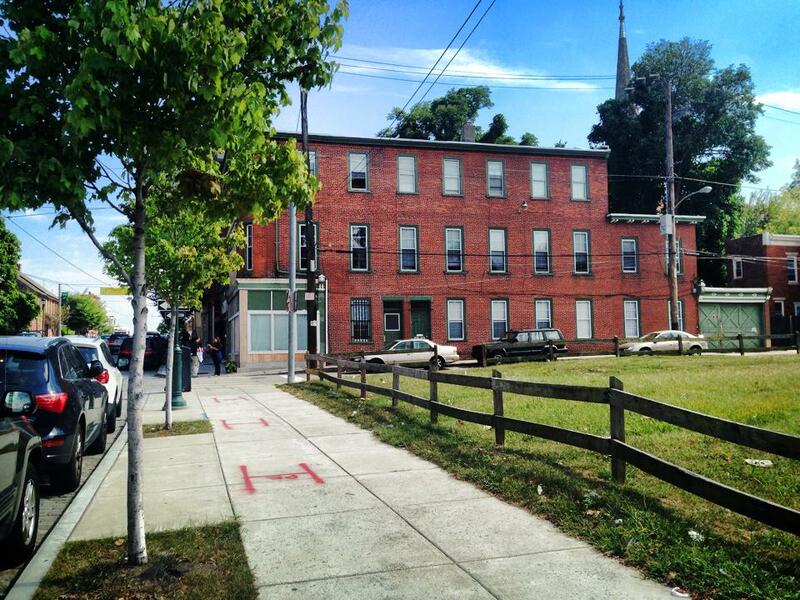 Developer Ken Weinstein, also of Philly Office Retail, is currently renovating 5301 Germantown Avenue, a six-story property next to Holsey Temple at the corner of Germantown Avenue and Penn Street. 5301 is the largest building on the block and will feature a 1,600 sq ft cafe and restaurant space on the ground floor and 11 market rate apartments, in addition to an unknown residential use on the upper floors. Weinstein has said he cannot legally disclose the name of the non-profit or the nature of the additional residential use, which is rumored to be a shelter. Prior to the NewsWorks story, there was much online chatter and speculation about what was coming to the construction site. Co-owner Patricia McKinley noted that outreach was done to nearby community groups, businesses and institutions, but that still left many other Germantowners clueless. 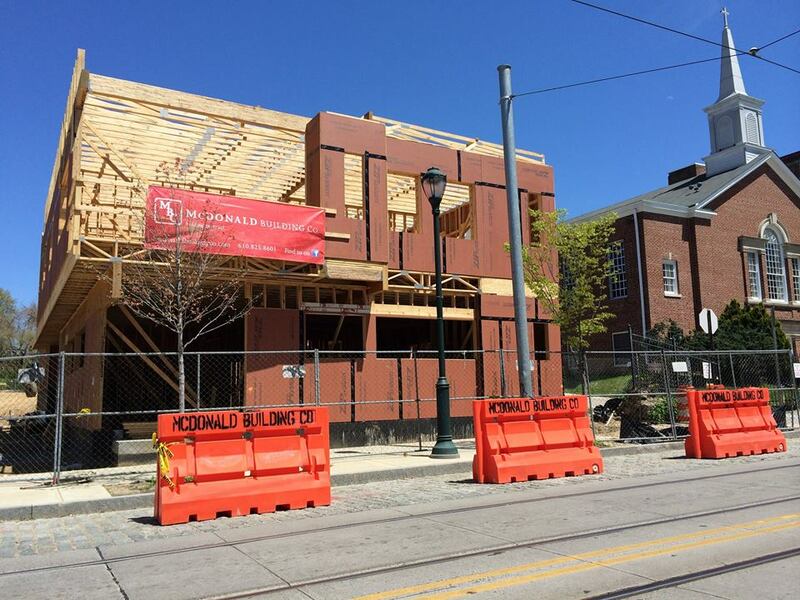 Some residents who misread the banner advertising McDonald Building Co. were relieved to find out that the fast food chain McDonald’s was not coming! A quick Google search of McDonald Building Co. leads to a rendering and project description for the new building. 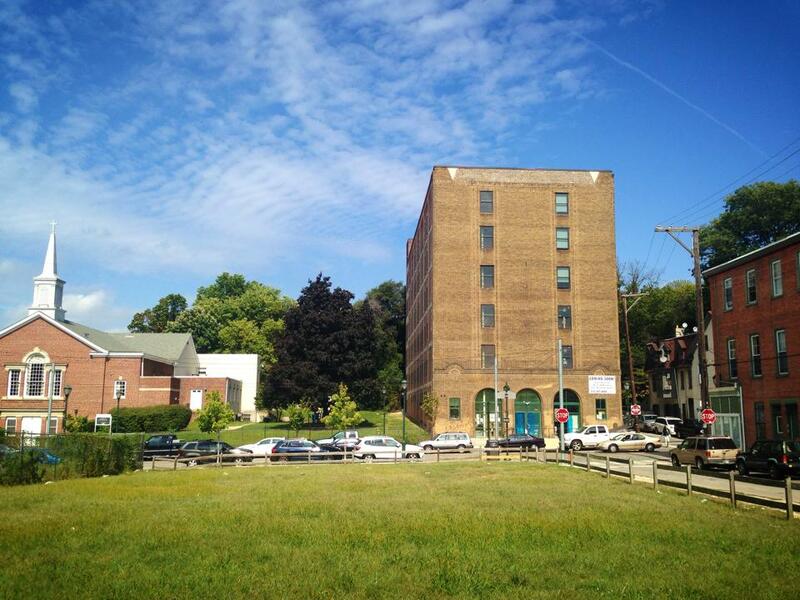 Recent confusion about this development and others has revealed that Germantown (and Philadelphia at large) needs better practices for getting information out to the greater community. Improved signage at development projects would be one quick solution. Take a look at these two signs outside of construction sites in New York City and Toronto. “Improving non-stop. I like how the MTA in NYC always explains the work they’re doing,” writes Emaleigh Doley on Instagram. “Big development notices are made very public in Toronto,” notes Ashley Hahn on Instagram. Click to enlarge photos by Emaleigh Doley (R) and Ashley Hahn (L) snapped while traveling via Instagram. Informational signage works to both squash speculation and engage residents in the development of their neighborhood. It would be to Germantown’s benefit to establish a standard sign template for high profile projects that goes beyond the often confusing (and tiny) zoning, construction, and permit postings required by the City of Philadelphia. Perhaps this is something the local community development corporations G’Town Restoration CDC and Germantown United CDC can collaborate on with the neighborhood’s Registered Community Organizations.